It's time to start planning those Game Day menus, and nothing says football like a big plate of Buffalo wings. But let’s be honest… as delicious as they are, wings can be a little messy, especially at a party. 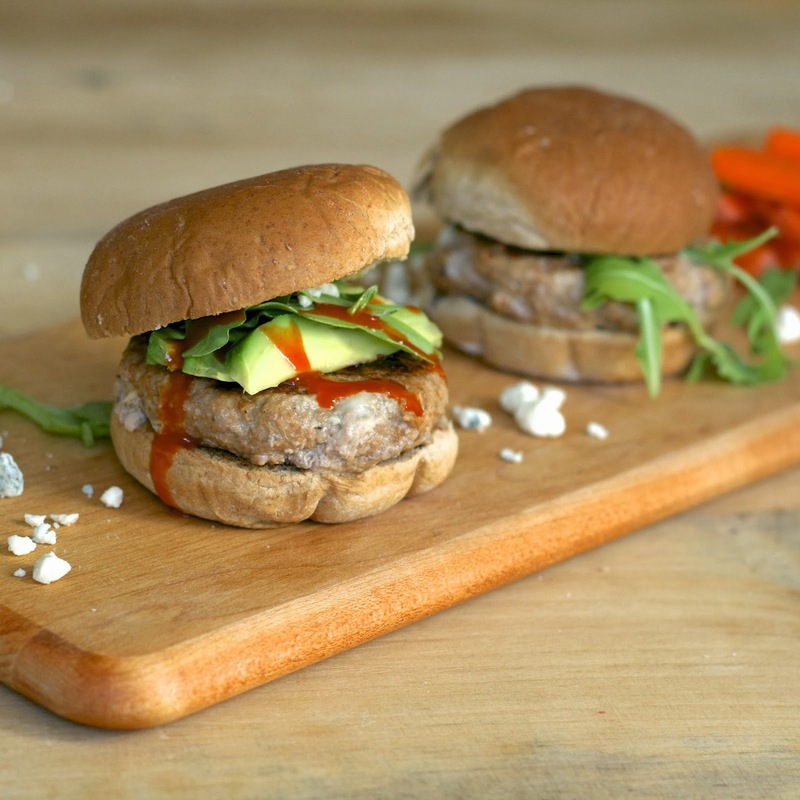 Not to worry… there’s a way to replicate that tangy, spicy taste in a way everyone can enjoy… sliders! These sliders are like the love child between my March Madness Buffalo chicken sliders and my inside out burgers. These use either ground turkey or ground chicken and are stuffed with Gorgonzola cheese… a classic pairing for wing sauce, which is mixed directly into the ground meat. The ingredient list is super short for these. All you need is some ground turkey or ground chicken, crumbled Gorgonzola cheese, onion, garlic, wing sauce and slider buns. (plus, any additional toppings you like). Place ground meat in a bowl, along with minced garlic, and grate about 1/4 of a yellow onion over the top, allowing the onion juices to season your meat. Season with salt and pepper and gently mix using your hands. Be careful not to overmix, as this will make for tough burgers. Evenly separate into 6 patties (about two ounces each). Place one tablespoon Gorgonzola cheese in the center of each patty. Bring up the sides around the cheese and press together to engulf the cheese in the middle. Flatten back out. Repeat with remaining five patties. Refrigerate them until you're ready to grill to help the meat firm up a bit. These are great on the outdoor grill, but if it’s too cold, you can totally make them inside (either in a skillet or on a Foreman-type grill). Cook 5-6 minutes per side over medium heat. If using a grill that cooks both sides at the same time, just cook 5-6 minutes total. I actually used my Panini maker and it worked great… aside from the cleanup. Serve on toasted slider buns and drizzle with additional sauce if desired. Top with red onions, arugula or avocado. Serve with a side of carrot or celery sticks for a play on traditional wing accompaniments. Game on! Combine ground meat with grated onion, minced garlic and wing sauce. Season with salt and pepper. Lightly mix together using your hands, taking care not to over-mix. Evenly separate into six patties (about 2 ounces each). Place 1 tablespoon Gorgonozola cheese in the center of each patty. Bring up the sides around the cheese and press together to engulf the cheese in the middle. Flatten back out. Repeat with remaining five patties. Serve on toasted slider buns and drizzle with extra sauce and your favorite burger toppings, if desired.